Those hoping to fill their Super Bowl Sunday bye-week with some high level high school basketball are in luck. 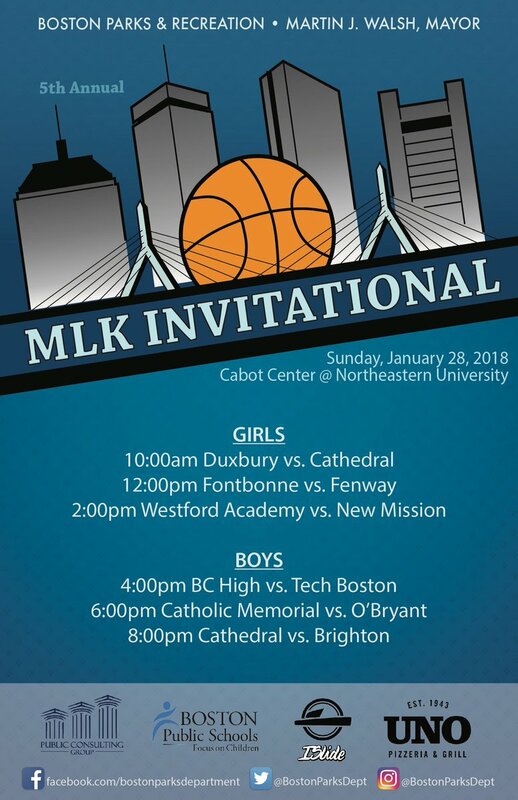 The 5th annual MLK Invitational, presented by Mayor Martin J. Walsh and Boston Parks and Recreation Department, will take place this Sunday at Cabot Gymnasium on the campus of Northeastern University. The MLK Invitational has become the premier single day high school basketball event in Massachusetts. The best teams from the City of Boston compete with highly ranked programs from across the state. 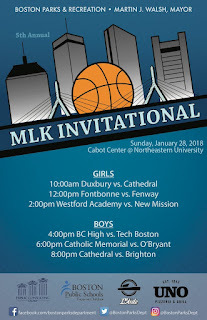 In its first four years, the MLK Invitational has produced 9 state champions (Brighton ‘17, New Mission Boys '16 & '14, Cathedral Girls '16 & ’17, Bishop Fenwick Girls '16, Catholic Memorial ‘15, Duxbury Girls ’15, St. Mary’s Girls ’14), along with 13 sectional champions. A trio of high-level girls games kick things off as Cathedral (9-3) takes on Duxbury (7-3) at 10 a.m. before undefeated Fontbonne takes on City League powerhouse Fenway (7-2) at noon. Annual contender Westford Academy (9-2) faces off against New Mission (7-1) at 2 p.m. to cap off the girls slate. The boys’ side begins at 4 p.m. with 9-2 BC High taking on one of the top teams in the City League, Tech Boston (9-0). BC High has won eight of its last nine games while the Bears have scored 70 or more points six times. Catholic Memorial (8-4) and O’Bryant (10-3) will follow suit at 6 p.m. The Knights are paced by freshman standout point guard Kurtis Henderson and senior Kani Glover. O’Bryant, meanwhile, has one of the best juniors in Massachusetts in Rivaldo Soares to complement freshman Dasonte Bowen. Defending Division 2 state champion Brighton (6-5) caps of the day as they face off against Division 4 power Cathedral at 8 p.m.